For many years Sherman modelers who liked the later variants of the M4 medium tanks were stuck with only two bad options: the Tamiya M4A3E8 kit which was “rubber band” track era design (as well as being about 1/33 scale) and the even older Revell M4-something that apparently was based on postwar M4A1E8 rebuilds but with a 75mm turret. Neither one was much more than a caricature of the actual tank. About 20 years ago DML began to release new mold kits of the M4 family, initially based on the M4A1 kit by Italeri from the mid 1970s. These steadily improved and eventually DML released a kit of the M4A3E8 in their Imperial series which relied heavily on the Italeri kit but with a new upper hull, suspension and turret details. Later this kit was reworked in their Korean War series (No. 6811) with T80 tracks in styrene and other changes. 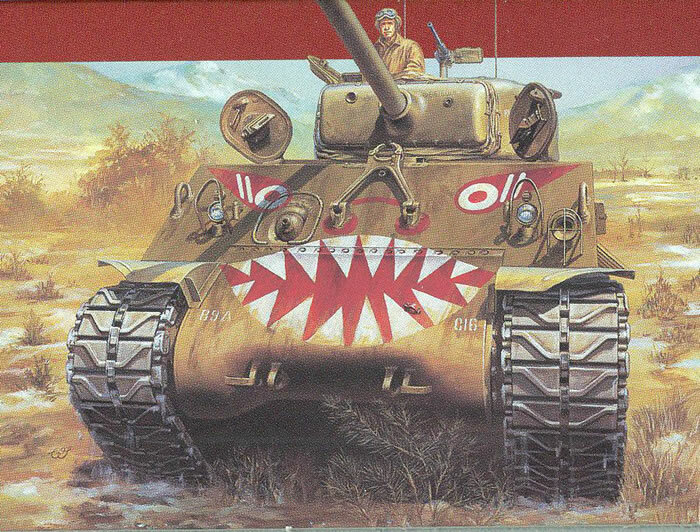 For its time it was a vast improvement over previous kits and did give modelers a good basis for making a Korea War Sherman, including the famous 89th Tank Battalion (“Rice’s Red Devils”) markings. Over the years DML refined the kits and later came out with a much better set of tracks using their DS Plastic for the main runs with separate T80 guide teeth; these have a “light bulb” profile and face fore-and-aft so had to be added separately. But the kit still had some crude spots. When the Tasca Sherman kits first appeared they met with universally high marks from all fans of the M4 Medium Tank. Like DML Tasca used a “mix and match” system of sprues to fit the particular version of the tank that the kit was to represent. After many of the earlier 75mm tanks they then branched into the later M4 (47 degree hull, 76mm T23 style turret) variants, and ultimately also offered the HVSS suspension as well as three different VVSS suspensions. Marrying them up with a new set of decals was a logical conclusion. About a year ago the company changed its name from Tasca to Asuka and continues to offer these kits, plus the Japanese website also indicates individual sprues from many of the kits may be purchased separately for custom uses or specific sub-variants. Believe it or not, this is only the second Tasca/Asuka kit I have picked up (I had a huge backlog of DML and MP Models ones!) Like the first one, their M4A3E2 “Jumbo”, I am very impressed at the quality of the kit and what it includes. As noted the kit consists of some 15 different sprues (24 in all) to tailor the kit to produce the M4A3E8 tank version used in Korea with T80 tracks. All of the hatches are optional position to include the shell ejection port, the hull is set up for a drop-in engine kit from an aftermarket company, you have a choice of clear or solid styrene vision blocks and a vision cupola (as well as headlight lenses), two different styles of drive wheels, a choice between mounted or stowed M2HB turret machine gun, and other items. It also comes with extra ammunition cans and four 5-gallon jerry cans. The biggest headache for this kit is its tracks. They consist of four black vinyl runs (read you have to use ACC to assemble them) but you have to attach 384 separate cleated faces and 192 guide teeth to them. While even DML had to provide separate guide teeth the separate faces are a bit much (would assume this way they could also use them for the later T84 rubber tracks so only one set of basic track runs is needed. The rest of the kit is pretty straightforward. Wheels all have vinyl keepers inside them so they rotate (which I have always found simplifies painting without a mask). The idler mounts are left loose so they can be rotated to take up any slack from the tracks during installation in Step 13. The lower hull consists of some nine parts that form an engine bay when complete, and unlike the older Tamiya Shermans it also comes with sponson floors over the track runs. Be careful as there are some duplicate parts on different sprues such as engine decks and mounts for the idlers. Each HVSS bogie consists of 19 parts and if assembled carefully are supposed to flex and move per the original. While I doubt many modelers are interested in this feature it does mean leaving things loose until the suspension is in place and then using liquid cement to “freeze” it in place once leveled. The hatches provide alternatives for periscopes up or down and covers are separate parts. Etched brass guards are provided for the main hatch periscopes. The engine deck gives a choice of hatch covers for the engine bay, either early model or late model with torsion bars for easier opening. The model even includes the “Little Joe” auxiliary engine exhaust (Parts C65/66) under the left sponson. While the tools do not include etched brass straps they are nicely done and look the part when in place. Both an early and a late exhaust deflector set are provided, but in this case the kit is to be built with the late model one used. Anyone wishing to make a late WWII tank can use those parts separately. The turret comes with a four-part canvas cover that fits onto the mantlet; with some roughing up via putty or textured paint it should look fine. As this tank uses the M1A2 gun the muzzle brake is installed, but the kit comes with a straight M1A1 barrel and a keeper for the M1A1C as well. The M2HB itself consists of six parts with a choice of regular or quick-change barrel with handle, and the action may be either open or closed. The cradle adds another six parts and if desired a belt of ammo is included for use with an open ammo box. The machine gun can also be stored on the racks at the rear of the turret. There are two finishing options: Charlie 16, 89th Tank Battalion (“Rice’s Red Devils”), Korea 1951; or “Skeeter Hawk”, 64th Tank Battalion, 3rd ID, Han River 1951. Both come with the colorful markings (89th as a dragon, 64th as a tiger on a 3ID patch). Overall this is a nice kit and up to the Tasca/Asuka level of quality, but the tracks could have been better thought out.